Beat the eggs together with the sugar until light and foamy and set to one side. Combine the flour and baking powder in a separate bowl and add the lemon zest. In a jug, mix the honey with the milk and the cooled butter, then add the eggs. Gradually fold the flour in the the eggs and milk until well mixed, then cover and leave to rest in the fridge for a few hours. Meanwhile, you can make the lemon curd. In a small saucepan add the lemon zest and juice, and the sugar and heat gently until the sugar and butter have melted. Remove from the heat and allow to cool for a few minutes. Whisk the egg yolks in a bowl, then add to the pan and whisk. Then return the pan to a gentle heat, whisking the whole time, until the curd starts to thicken. Make sure you stir the curd the whole time as the eggs could curdle. Once the curd is suitably thicked, remove it from the heat and pass through a sieve into a bowl. Place cling film directly over the top of the curd (in contact with the top to stop a skin forming) and place in the refrigerator for at least an hour. When you’re ready to bake the Madeleines, preheat the oven to 190°C/375°F/GM 5. Butter and flour a 12-shell Madeleine tin, and add a heaped tablespoon of batter into each shell. Bake the Madeleines for five minutes, then turn the oven off for one minute to give the Madeleines their signature peaks. Now turn the oven to 160°C/325°F/GM 3 and bake for a further five minutes. Transfer the Madeleines to a cooling rack, wash and dry the Madeleine tray and repeat cooking process with a second batch. 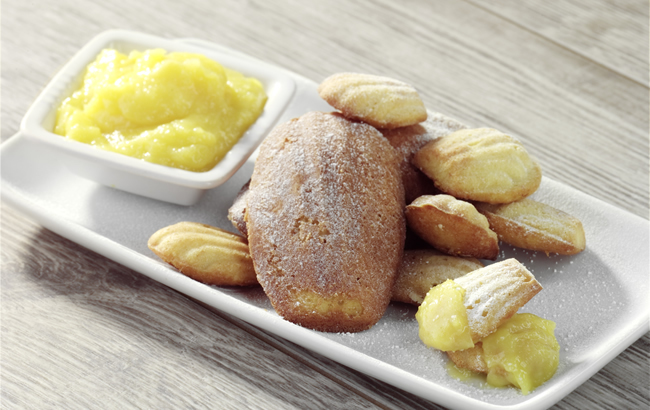 Serve the Madeleines immediately dusted with icing sugar next to a generously filled ramekin of the Lemon Curd.